An empty and crushed can of soda magically restores and refills before the eyes of the spectators. Impossible to improve? 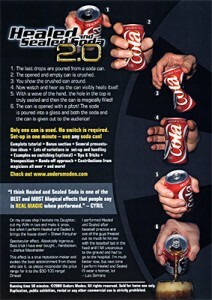 Here\'s the 2.0 version of Anders Modens ingeniousHealed and Sealed Soda, the effect originally performed by David Blaine on \"Vertigo\". Anders Moden shares his thoughts on the methods, the handlings and the presentations of his masterpiece. He will also guide you through various additional techniques that he has kept to himself. Until now. \'\"I think Healed and Sealed Soda is one of the BEST and MOST magical effects that people say is REAL MAGIC when performed.\"
\"On my cruise ship I levitate my Daughter, cut my wife in two and make it snow, but when I perform Healed and Sealed Soda it brings the house down!\"